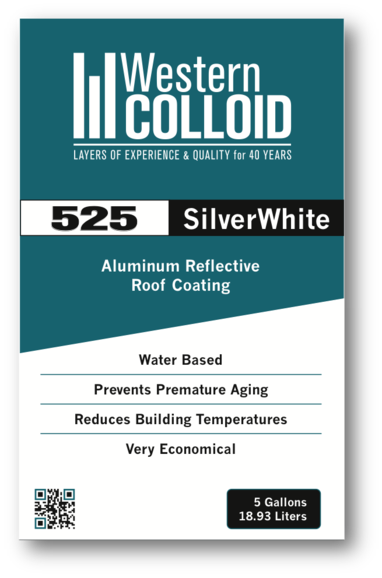 Western Colloid’s #525 SilverWhite is a durable, specially-formulated water based aluminum asphaltic emulsion which has been developed to resist rigorous weather conditions while protecting roof surfaces and can contribute to energy savings. #525 SilverWhite has excellent elongation and tensile strength. When properly applied #525 SilverWhite reflects up to 76% of the sun’s rays. This prevents premature aging and roof burn-out by reducing UV degradation and thermal shock. The product dries to a flexible, elastomeric, slightly textured film with a beautiful metallic finish, which will significantly slow down the aging of a roof system. #525 SilverWhite is recommended for use on metal, smooth BUR, mineral surface (primed with #298), emulsion and Glas Shield roof systems. #530 is specially formulated for roller & brush application.